Save money on heating oil bills. With the rising cost of heating oil, making sure that a boiler is efficient as possible is a must, an unserviced oil boiler can produce soot & combustion deposits, this will coat the heat exchanger of the boiler causing an efficiency drop, because of this your boiler will to cost more to run and increase your heating oil usage. 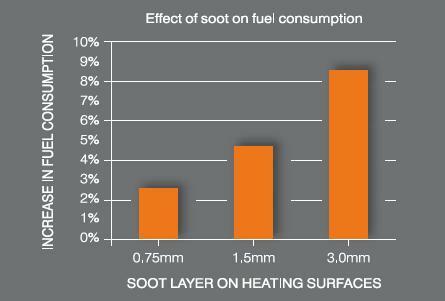 a 3.0mm layer of soot on a oil boiler can increase the average heating oil household bill by £110 (uk average 2000 liters a year, @ 65p per/liter). what to do if your boiler fails to work. -Check to see if there is oil in the tank, are the oil valves open (check sight tube, pull / push plunger to read). -Is electricity available to boiler (have the fuses blown). -Check programmer is on (red lights on calling for heat). Check thermostats are turned up on room thermostat, cylinder thermostat and boiler thermostat. -Is the water circulating pump operating? -Has the boiler overheated? Check thermal overheat reset point. -has "Lockout" occurred, if so press lockout reset button. If lockout occurs again wait 5 minutes and try again. repeat this procedure no more than 3 times. -Never try to relight a vaporising oil cooker (AGA, RAYBURN, ESSE) when hot. only relight when cooker is cold.